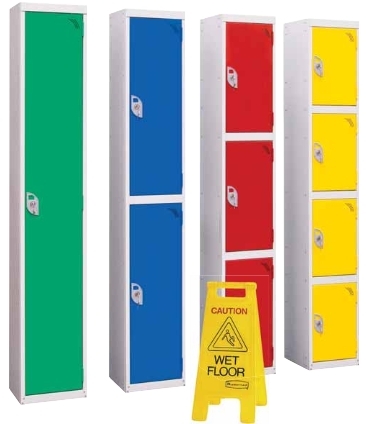 These lockers are constructed from pre-galvanised steel. • Ideal for swimming pools, changing rooms, saunas, industrial wet areas and food preparation plants. • 2, 3 and 4 door lockers fitted with security shelf to prevent unauthorised access to the compartment below. • Moisture resistant cam locks are fitted as standard for superior lock durability in moist environments. • Frame constructed from 1.5mm steel which ensures great strength and security. • Hinges are 75mm deep. This again offers greater quality and durability.